Thus far on Spontaneous Lunacy we’ve had a good mix of artists, hopefully some that are at least moderately familiar to readers, while others admittedly were likely to draw more of a tilted head, eyebrows raised look from those who are seeing these names for perhaps the first time. Not all of the artists of course will go on to leave a big mark on rock history. Which ones made it and why is one of the great underlying themes to these reviews as we attempt to analyze the hits and misses in order to paint a fuller picture of how the music evolved, what was capitalized on that would propel it to greater heights and also what fell by the wayside along the road to glory. But there’s another curious note to be made here as all of the artists covered thus far – even those who released some very successful records IN the fifties – are known mostly for their work in the forties. This entry is in some ways a look into the future. Though rock itself was still just getting its footing in the fall of 1947 and among those making it were a handful of seasoned vets experimenting with the new approach, there was also a lot of ambitious newcomers who seized on it right from the start as their chance for stardom and self-expression. An opportunity to define themselves out of the gate with a style untainted by familiarity, a blank canvas on which to paint their own portrait. If anybody in rock’s early days was keen on writing their own life story surely it’d have to be Smiley Lewis, as he’d seemingly been forced to create himself from scratch along life’s road already. Overton Amos Lemons had been orphaned as a boy and raised by a white woman in New Orleans. Or at least that’s how the story goes. His birth mother, Lilly Mae, passed away at some point during her son’s formative years, that much we know for certain, but while the rest of the family remained together with the other children being raised by a stepmother when their father re-married, what happened to young Overton remains more clouded. Some claim he was sent away to the city by his family who perhaps couldn’t sufficiently care for him. Others suggest he ran away from home – the most colorful version has him and some friends hopping a train for a joyride and when the others jumped off as it sped along he was too afraid to do the same and rode until it reached the end of the line in the big city. Once arrived, however he got there, he found himself overwhelmed in the bustling environs of New Orleans and was taken in by a family in the Irish section of town. How much of all this was speculation, how much of it truth, how much of it was a colorful tale of Smiley’s own creation will likely never be fully known. Regardless, Lewis was certainly on his own at a fairly early age and like many of the kids raised in the fertile soil of the bayou he was drawn towards music. Along the way Smiley learned guitar, joined a band that included pianist Tuts Washington, who’d go on to be one of the city’s local legends, and in his early twenties Lewis (the name possibly coming from the white woman who may have raised him) got married, did odd jobs and sang with the band on the side. That’s a story which, except for the details of time and place, could represent seemingly half of the rock artists over the next half century, both those who made it, but more tellingly those who never did. Countless unproven artists over the years had talent enough to dream big and ambition enough to gig incessantly, hoping beyond hope that somehow it’d pay off. When it didn’t pan out for most of them the stories end, though life itself carries on, but sadly for many who saw their dreams shattered those lives could cease to have much direction and meaning after that and they’d drift aimlessly through the remainder of their days, never quite coming to grips with how fleeting their chance at fame and fortune truly had been and how innocuously it all seemed to slip away before they even realized it. But Smiley of course did make it. New Orleans had always had a booming cottage industry for music, with countless clubs lining the streets offering live music as an enticement to draw in customers in an effort to amicably separate them from their money. Lewis, Washington and Noon Johnson on bazooka horn (an instrument made out of an iron bed post – let your imagination run wild!) held court at some of these saloons on and off for a few years and when employment opportunities in that scene weren’t quite so good he’d sing on the streets for spare change and simply for a chance to be heard by someone, anyone, who might be able to give him a break. By late 1947, with the new sounds of rock coming loudest from New Orleans, that break finally came. DeLuxe Records may have been based in New Jersey but they were built on the music of New Orleans with Paul Gayten scoring the first R&B hit to come from the Crescent City the previous spring. When his cohort Annie Laurie followed him onto the label and then onto the charts soon after (neither one with a rock-rooted tune, although both would quickly remedy that), and then were joined in late summer by Roy Brown, DeLuxe seemed to almost have an open door policy for anyone with a Louisiana mailing address, hoping for similar results. 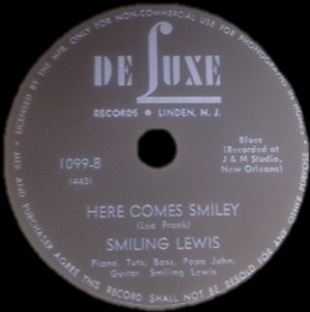 Lewis became an early beneficiary of this local talent hoarding by the label, credited as “Smiling Lewis” on the autobiographical Here Comes Smiley. 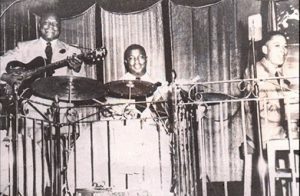 Sung with clear diction, his trademark bellhorn voice a bit subdued, either by more primitive recording facilities or due to inexperienced nervousness, yet already possessing its odd natural metallic echo, a trait he shared with a few notable others such as Howlin’ Wolf and Little Willie John, Lewis is the picture of cautious optimism here. The lyrics, the delivery, the very circumstances of a debut session itself combine to give a pretty fair approximation of the emotions every singer who steps to a microphone in a professional environment for the first time must be silently thinking. This must’ve been especially true for those who’d grown up poor in the segregated south, now facing a post-War world reputedly filled with promise but due to their own harsher real life experiences, promises which must’ve seemed like a cruel myth created to frustrate them, a mere pipe dream not worth even hoping for. Yet here they were all the same, a few of the more fortunate ones anyway, taking their shot at the brass ring that remained tantalizingly out of reach for most, hoping beyond reasonable hope that it’d be they who could beat the odds and make a career out of it, perhaps even become a star. Though the record itself is hardly the stuff long term successful careers are built on it’s got plenty in the way of winsome charms to captivate you, especially now, years later knowing of Lewis’s heartbreaking career trajectory. Accompanied mostly by Washington’s deft piano, almost acting as a reassuring voice to bolster Smiley’s confidence, the mood set is one of a daydream, a starry-eyed wish for something better than what you know you’re destined for. As captivating as Smiley’s singing is, conveying a disarming sweetness of character, humble but hopeful in his earnestness, musically speaking it’s Washington who is as much the star of this record as Lewis, as Tuts’ nimble work on the keys inject some spryness to the proceedings, knowing just how much to lay back and when to embellish. That Washington himself would neglect recording for decades after this, content to simply earn his living in the thriving Crescent City club scene, is one of rock’s most unfortunate quirks as he was every bit the captivating performer on piano as any of his more lauded contemporaries. What’s more for those who are interested in such things (and why wouldn’t you be?) we at long last have Smiley’s own guitar solo present and accounted for, something edited from the released single version that you hear on the Spotify track on this page, but thankfully the unedited version appears on the strikingly clear sounding acetate that was unearthed and re-mastered by Ace Records of Great Britain in 2016, available on the monumentally important historic collection of New Orleans rock at that time, Beef Ball Baby (available below – click either link to buy from Amazon and get us a “hefty” commission in the process). Lewis was by all accounts a fine guitarist, but never got the chance to play on his own sessions after this, as the studio bands of Dave Bartholomew had a litany of even better guitar slingers to allow Smiley to focus entirely on vocals. Thankfully the rescued solo shows Lewis’s long rumored reputation was well founded, for while it’s not earth-shattering it’s very effective within the context of the song. You can understand why DeLuxe pulled it, for without it the record is a bit tighter as there’s no respite from the downhearted mood his voice sets, but it’s still great to finally hear. But while the amazingly cleaned up sound of the recent CD release cuts through some of the murkiness and the mystery that surrounded the record for years the overall effect remains intact, presenting a performance that has an innate sadness to it. Smiley offers up a melancholy self-portrait, someone who has no cause for optimism as the dark clouds gather overhead, yet still allows his eyes to be cast upwards for a moment to see if there’s any brightness on the horizon… giving voice to the yearning hope inherent in ALL people that somehow still is able to shine through in life, however fleetingly. I’ll admit maybe this feeling is exacerbated in ways that wouldn’t have been possible back then, when he was just an unknown name on a record label with his whole future ahead of him as a recording artist, but today, fully aware of Lewis’s ultimate fate where fame and fortune seemed tantalizingly close numerous times and yet always seemed to slip away, like the images of a dream once the reverie faded upon waking, it takes on a bit of a tragic feel that comes through in every word he sings. But that’s also what makes it so alluring. His longing for something better sounds so fragile you’re afraid to breathe and break the spell. Throughout it you want to tell Smiley not to wake up, to hold on to that dream a little bit longer, to etch it into his mind so he’ll never forget it, yet the whole time knowing when he opens his eyes it’ll disappear all the same. It’d be more than two full years before he’d get another chance to make a record. Leave a reply on "Smiley Lewis: “Here Comes Smiley”"